Doorstep Astronomy: See Saturn and Jupiter Now! SKY MAP: Jupiter and Saturn as of 10 p.m. local time from mid-northern latitudes. Saturn and Jupiter are easy to spot in the early evening sky now. During the winter and early spring these planets were at their best when they reached their respective oppositions to the Sun (Saturn on January 13, Jupiter on April 3). At these occasions, besides shining at their very brightest and appearing largest in telescopes, these two planets were visible for the entire night, rising at sunset, attaining their highest point in the sky at midnight and setting at sunrise. But there are three reasons why the views of Saturn and Jupiter may be even be better now and in the next few weeks. First is the weather factor. During the winter season temperatures on many nights for most parts of the country were no doubt quite cold to downright frigid making prospective observers extremely uncomfortable. Now, with the official arrival of spring well behind us, there is the promise of moderation of chilly nighttime temperatures in the days and weeks to come. The second reason is the placement of the planets. Weeks ago, you would have had to wait until late in the evening or the middle of the night for Saturn and Jupiter to both be positioned well above the horizon. Now, that wait is over. Both planets are well situated for viewing as soon as it gets dark. This is especially true in the case of Saturn, which arrived at east quadrature on April 10. Quadrature occurs when a planet, as seen from the Earth, forms a right angle with respect to the Sun. This means that when the Sun sets in the west, Saturn is reaching its highest point in the southern sky. 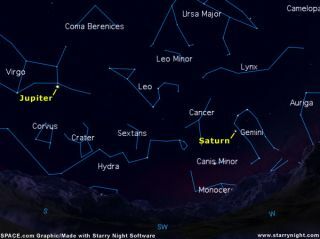 The third reason is that Saturn and Jupiter will be especially "showy" in the days ahead, especially on the evenings of May 12 and 13 when a lovely crescent Moon will be passing Saturn, with Pollux and Castor, the "Twin Stars" of Gemini hovering close by. Then, on the evening of May 19, the Moon, now a waxing gibbous phase, will be situated very near to Jupiter. Jupiter glares high toward the south-southeast at dusk during the evening hours, the brightest "star" in the sky, and inviting inspection the moment you set up a telescope. It then descends toward the west for much of the rest of the night. As seen from Earth, Jupiter is retrograding, or moving west through the dim stars of the large and relatively dim zodiacal constellation of Virgo, the Virgin. All month long, the giant planet lies within less than two degrees of the third-magnitude star Porrima, named in honor of the "Goddess of Prophecy." This star is actually a double star; one of the earliest pairs to be discovered with the telescope, by James Bradley and James Pound in 1718. The components revolve about each other over a time span of 171-years and are equal in brightness at magnitude 3.9. In 1920 they attained their greatest separation in telescopes, equal to about one-fifth the apparent width of the Moon; the stars have since been closing in on each other and they now appear as a single point of light except through large and powerful telescopes. Jupiter has the largest apparent disk of any bright object in the sky after the Moon and the Sun. It's dark belts and bright zones with their subtle markings resolves into a series of red, yellow, tan and brown shadings in most telescopes, and of course its four large and bright moons can be followed for hours, even in steadily held binoculars. Through a telescope you can watch as they speed in front of Jupiter, throwing their shadows on the planet, or vanish behind its disk or suddenly becoming eclipsed by its shadow. On the evening of May 19, the waxing gibbous Moon will appear to pass very close to Jupiter. Many people gazing skyward that night will probably be wondering what that bright "star" hovering above to the right of the Moon is? Perhaps some will call their local planetarium to report a "strange U.F.O." hovering close to the Moon. Across the northern half of South America as well as part of South Africa, the Moon will appear to cross in front of Jupiter that night, resulting in a spectacular occultation. In Gemini, the Twins, Saturn is readily visible as a yellowish-white zero magnitude "star" high in the southwest sky at dusk and is visible during the first half of the night. Even a small telescope will provide a wonderful view of Saturn's beautiful ring system, now tilted 23.6 degrees toward the Earth. All through the balance of May, even in small telescopes, Saturn's ring system is displayed broadly with chilling elegance. Right now the southern side of the rings are facing Earth, but not for long. The rings are slowly pitching back and by the summer of 2009 the rings will have turned edge-on toward Earth and will be exceedingly difficult to see. Saturn was at east quadrature (90? east of the Sun) on April 10. Quadrature occurs when a planet, as seen from the Earth, forms a right angle with respect to the Sun. So now is also a good time to see the shadow of the planet cast well off to its eastern side, giving the planet and its rings a greater depth in appearance. As it slowly tracks eastward through Gemini, take note of how Saturn changes its position relative to the "Twin Stars" Castor and Pollux during the month. A fattening crescent Moon will be passing through this part of the sky on the evenings of the 12th and 13th. On the latter night, the Moon forms a large triangle with Saturn and Pollux.